Having found Sanjeev Bhaskar's work in "Goodness Gracious Me" I thought I'd give this a go and am glad that I did as it is pretty funny. 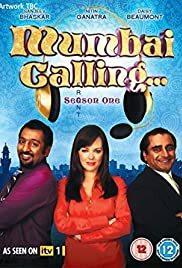 British Indian Kenny Gupta is sent from London to take over the running of a call centre in the Indian city of Mumbai because head office think that as an ethnic Indian he must understand that country even though he has lived in London all his life. When he gets there he makes friends with Dev, a local Indian who is fairly work shy but usually comes good in the end. The third main character is Terri Johnson, an English woman sent out after Kenny to help manage the centre. The people who man the phones in the centre tend to take a lesser role in the plots of each episode although they are the source of some of the biggest laughs as they deal with various calls from the UK. The episodes are all self contained so it doesn't matter if you come to the series late or miss an episode. The acting is pretty good, not just from the main three characters but also from the supporting cast. I don't know if there will be a second series, I certainly hope there is though as I really enjoyed the first.